Martin Furniture, Heritage Office Collection, Dimensions: 70"W x 18"D x 34"H. Weight: 234 lbs. Construction: poplar solids and veneers. Drawers: two utility drawers, one letter/legal-sized hanging file drawer. Storage: six shelves (four adjustable). Ships fully assembled. 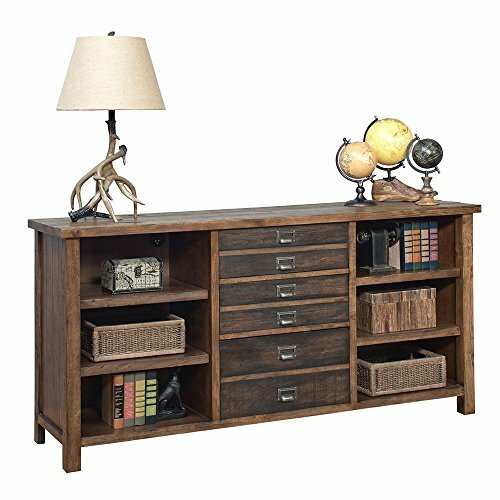 Add rustic flair and storage to any space with the Heritage storage credenza. The two-tone finish, worn drawer pulls and weathered appearance give this credenza visual appeal that will draw everyone"s attention. This versatile piece can be used to display a TV, decorative items, store hanging files and supplies. The uses are endless.